This is a copy of a news article I appeared in on December 18, 2015. (see page 6). My colleagues and friends from the Upper Pascack Interfaith Clergy Team. Article in the Jewish Standard. Article by Joanne Palmer. Photo by Antony Morales. More news about the event can be found from PIX11 here (includes a video with me) and Daily Voice: Pascack Valley. Glass half full or half empty? Full-on war of civilizations or a chance for unlikely allies to come together? Hope or no hope? 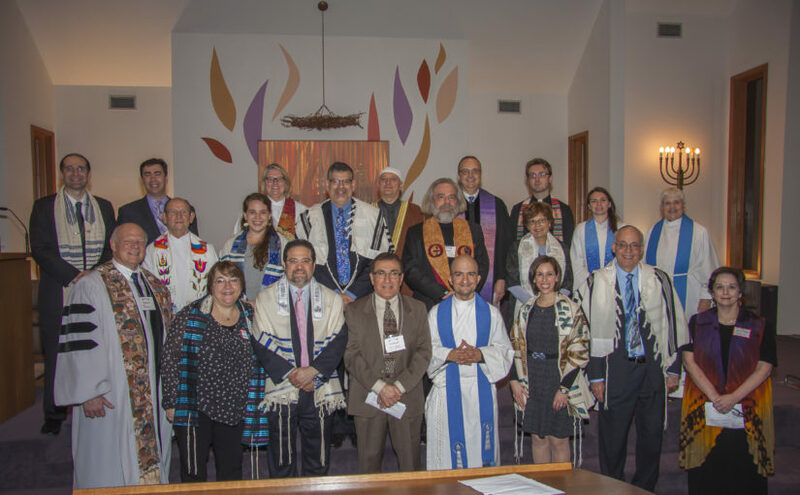 In response to the massacres in Paris and even more in San Bernardino, a group of religious leaders of the three Abrahamic faiths came together in Temple Beth Or in Washington Township on Sunday night. They were joined by an estimated 350 to 400 others, Jews, Christians, and Muslims, who chose to gather, light Chanukah candles on the holiday’s last, most light-filled night, and demystify themselves to each other. “We brought together 18 different communities of faith,” Rabbi Noah Fabricant, who heads Beth Or and who spearheaded the meeting, said. “The entire event was put together in about a week. Hateful rhetoric toward Muslims was increasing” — that was the week when Republican presidential hopeful Donald Trump said that no Muslims should be allowed into the country, although he was not clear on what he would do with those here already — “and I felt a need for a community response.“So my congregation began to reach out to other local congregations, and I reached out to local clergy” through the Upper Pascack Valley Clergy Council. Rabbi Fabricant, who is Reform, also talked about the program with rabbis and cantors from the Ridgewood area, and he discussed it with members of the North Jersey Board of Rabbis, the body that represents Conservative, Reconstructionist, and Reform rabbis. Some rabbis and cantors came from eastern and southern Bergen. His Christian and Muslim counterparts also talked up the program in their own organizations, and drew some people from outside the upper Pascack Valley.It was an intergenerational crowd; lots of teenagers as well as their parents and emptynesters came out for the program.The evening opened as the clergy members processed formally down the aisle, continued with readings from the sacred texts of all three religions, and culminated with the menorah lighting. “I created a text, a kavannah” — an intention — “for each of the candles, so that as we lit each of them we could express a commitment to our vision of unity and standing up against bigotry,” Rabbi Fabricant said.But real human relationships rarely grow out of formal structures. “We wanted an opportunity to socialize, so we had a reception, with lots of food, and we stayed and talked and met one another, and made the face-to-face connections that are so important to reducing fear.“It was wonderful,” he said. He was moved by much of what he saw that evening, but two incidents stood out. “Two Muslim women came up to me after the service, and one of them said that in the last few weeks, since San Bernardino, she’d had trouble sleeping. She felt really afraid. “Being at this event, seeing all those people standing with her, really brought her a sense of safety. A sense of physical safety and comfort. She said that she thought she’d sleep better that night. That was really powerful for me.”And then there was the ceremony itself. “As the clergy walked in, the congregation was invited to sing ‘This Land is Your Land.’” That, of course, is the haunting, camp-evoking, quintessentially American Woody Guthrie song whose lyrics go “This land is your land/This land is my land/From California to the New York island;/From the redwood forest to the Gulf Stream waters/This land was made for you and me.”“Quite a few people said to me afterward that after that song, you could have stopped right there,” Rabbi Fabricant said. “That, right there, was the message.” Imam Moutaz Charaf and 25 to 30 of his congregants represented the Elzahra Islamic Center in Midland Park, one of the two mosques to send a delegation. His mosque is a cross-section of Muslim Americans, he said; some are American-born and others are immigrants. Their roots are in India, Pakistan, and across the Arab world; most now live in Midland Park and the small towns that surround it.The meeting was important, Imam Charaf said. “We are living in a difficult time for all people of faith, and all Americans, so we thought it was a good time for people of faith and their leaders to give a strong message of peace and unity and diversity, and of respect for each other.“We all stand together very strongly against all types of violence, aggression, discrimination, and hatred, and we felt that we need to send a strong message, and to show that we are standing together.“We have much in common. All religion calls for peace and love, and we should not accept any hate speech, or any discrimination against anybody. “We are all people of God, and we were all created by the same God. So it was wonderful to read scripture together, to pray together, to listen to each other, and to see each other and break down some of the walls that some of us have built between us. “It was good to see each other as human beings,” Imam Charaf said.The Rev. Mark Suriano of the First Congregational Church of Park Ridge went to the meeting, he said, “because, like Rabbi Fabricant, I was increasingly alarmed at how we used religion to separate ourselves from one another, and particularly from the Muslim community. So I was eager to go to emphasize the things that we hold in common. We are all religions of peace. And we all three are religions of the Book, and people who share at least some spiritual ancestry.” The evening was likely to be a success, he said, and he realized that, prosaically but tellingly, even before he went into the shul building. “I got there early, and I had trouble parking. It was going to start at 7, I got there at twenty to, and there were only a few spaces left. There already were more than 300 people there.“The camaraderie was amazing,” he continued. “No matter what faith they belonged to, people had a common concern and a need for better understanding. I saw people who were emotionally moved by the experience of being there.“It was overwhelmingly beautiful.”One of the things that most struck the Rev. Suriano was “the sign of peace.” It’s a Christian ritual, “a moment in the service where we are invited to turn to each other and say ‘Peace be with you,’ and the response is ‘Also with you.’“At this service, we were invited to find people we didn’t know and extend the wish of peace to them. We were encouraged to find people who didn’t look like us.“There actually was a great sense of people looking for people they didn’t know, and there was a great deal of excitement around it. It was very powerful.